Check out The Temple News’ exclusive video coverage as well as the print edition of the article. 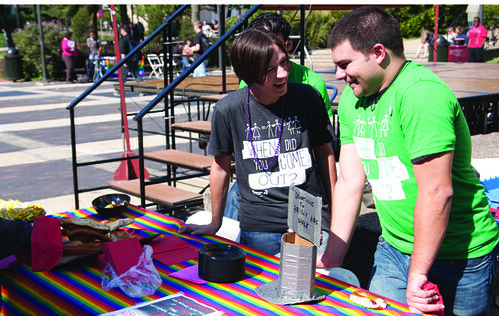 National Coming Out Week, celebrated on Main Campus from Oct. 4 to Oct. 11, involved tabling, discussions and rallies. National Coming Out Week events on Main Campus began Oct. 4 and ran through the National Coming Out Day rally at the Bell Tower on Monday, Oct. 11. Queer Student Union and Purple Circle, GLBT student organizations at Temple spent the week holding events and discussions to celebrate NCOW and address the concerns that are still a reality of the GLBT community. During NCOW, QSU tabled and distributed free NCOW T-shirts. WALBERT YOUNG TTN Junior nursing major Gwendolyn Morris (left) and Queer Student Union Treasurer Greg Swenson, a senior computer science major, collect money for Philly AIDS Walk after the National Coming Out Day rally yesterday. messages saying [things like,] ‘I support LGBTQ rights, and now I got a free T-shirt,’” said QSU President Nina Melito, a sophomore biology major. Melito recalled her own coming out story: After her mom confronted her, she initially came out as bisexual. “At that point I wasn’t really sure, so I came out as a bisexual at that point, and I started crying, and my mom said, ‘Oh, I support you,’ so I was bisexual for about a year,” Melito said. In her junior year of high school, Melito realized she was not attracted to males, she said, and began to identify as a lesbian. “Recognize that it’s OK to be gay, it’s OK for you to be bisexual or lesbian or transgender, and that is totally normal. But you don’t have to come out if you don’t want to,” Melito said. “Coming out is a process, and you should only come out to people when you feel comfortable. Don’t feel pressured into coming out. That just causes a lot of stress. I wouldn’t want that for anyone. It’s a very personal process because you’re basically stigmatizing yourself. “Go at your own pace, and make sure you know the resources you have available to you,” she added. Melito encourages gay youth to take advantage of local resources, such as those offered at the Mazzoni Center and the Attic Youth Center in Philadelphia. On Oct. 11, students rallied at the Bell Tower in support of NCOD and the GLBT community. Campus leaders and student organizations came to distribute information and share support. “This week is to promote awareness and bring visability,” said Rodney Prad of University Housing. Despite the week’s celebrations, the GLBT community still faces issues, Melito said. “Beyond gay marriage, the real pertinent issue now is rights for transgendered individuals because they are still the ones that really don’t necessarily [feel] as welcome into the queer community, and the world in general,” she said. Melito said she believes there are gay, lesbian and bisexual individuals who may not fully understand what being transgender is, adding that this awareness is something she and the GLBT community as a whole need to work on. “Last year, [QSU was] doing the gender-neutral bathroom petition. We were saying ‘Let my people pee,’ because they really don’t have anywhere to go to the bathroom and that’s a big problem,” Melito said. “[Temple should] take active steps to address the transgender community,” said Scott Gratson, the director of undergraduate studies in the School of Communications and Theater and an adamant on-campus ally to the GLBT community. Gratson added that Temple still has work to do in addressing the concerns of the GLBT community in general. “Comparatively, Temple has not focused on understanding the needs of the GLBTQ student population as much as our peer and aspirant institutions. That fact should clearly change. Systematic, public, dedicated and specified outreach should be undertaken in order to make the LGBTQ population truly part of the framework and tapestry of this institution. Relying only on extremely dedicated, tireless students to accomplish this aim is simply not fair,” Gratson said. Among the QSU-sponsored NCOW events was a diversity panel. “One of QSU’s goals this year is to reach out to LGBTQ people that aren’t recognized and that don’t normally come to QSU meetings. We realize that our meetings are mainly populated by white individuals, so we’re trying to reach out more to individuals of color and individuals with disabilities, so we’re having a panel with people of all shapes and colors, and we’re going to talk about coming out as a community,” Melito said before the event. On a larger scale, Gratson said he has seen a very diverse GLBT community. “When one looks at the demographics at youth and community centers, the very future of the movement, one would find a pretty diverse group,” he said. Gratson completes his work as a GLBT proponent at the Hetrick-Martin Institute in New York, the largest GLBT educational and service organization in the nation. “Sexual and affectional identity spans across races, religions, cultures, ages and ethnicities,” he said. Purple Circle held an arts- and poetry-share night during NCOW on Oct. 7. During the event, members shared songs and poems, while the rest of the room sang and danced with them. Ash Yezuita, Purple Circle president and QSU events coordinator, addressed the group during the event. During the event Purple Circle members could sign up to help out with the “It Gets Better” project, a national YouTube initiative that started in late September in response to the string of at least five recent suicides by gay teenagers. “I find it harrowing to know that as I walk past a homeless youth on the streets of Manhattan, I realize that there is about a 40 percent chance that they have been sent out of their house by their own families after coming out to them,” Gratson said. Despite great strides made recently for the GLBT community, Gratson said there is a lot more to do. The outpouring of support for members of the Temple community last week was a spectacular show, no matter the circumstances. AJ Young is having his life documented in the Web series “A Man Who Takes Place Of” as he completes his transition from female to male.